Bar, Restaurant, or the Private Dining Room? 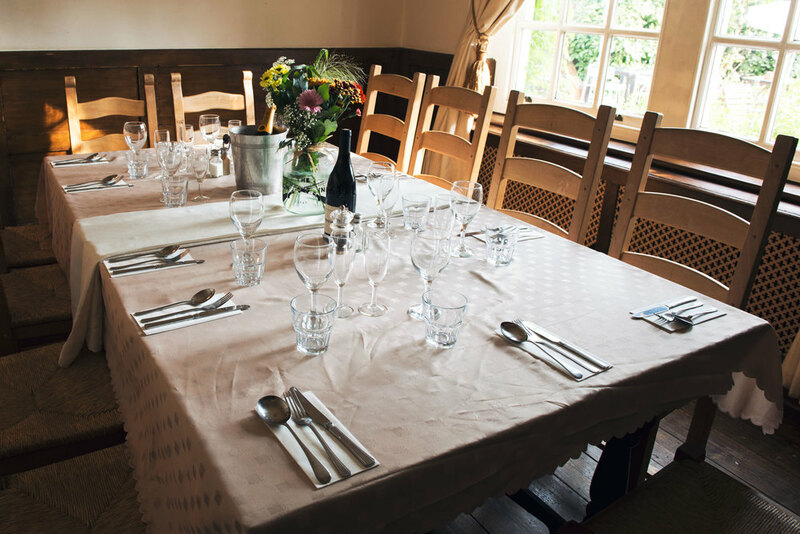 Here you can find all the information you need about booking a table, as well as guidance for larger bookings and events. The easiest way to enquire about a table is to contact us directly over the phone. You can make a reservation by calling (01903) 873206. The large bar area is an cosy place to enjoy our varied menu as well as our selection of lagers, real ales and wines. Much of the original structure of the pub is visible as it was when it was first built, with long, dark beams running the length of the building. Sally has created some wonderful monochrome art based on historic photos of the pub which can be found here too. The bar even features a 'Findon Window'! We welcome dogs of all shapes and sizes into the bar, as well as children of varying proportions also. Free Wi-Fi is also available! Seats up to 34 (arrangements vary). Our larger restaurant area is available upon request for private hire, although usually it functions in the same way as the bar. It is very light, bright and spacious, with large sash windows and more original artwork by Sally. This younger part of the pub we reserve solely for those wishing to eat. The private dining room is a combination of the best of both the bar and the restaurant. It is light whilst featuring a large original fireplace, and offers a lovely environment in which dine, away from the bustle of the pub. This room hosts our gallery of images from around Findon, taken whilst walking 'The Gun Dog', Missy. Call (01903) 872 235 to reserve a table, enquire about a room, group booking or function.